Located at a distance of 15 kms from the Pink City of India, Jaipur the magnificent royal construction Jaigarh fort is a piece of incredible architecture. This amazing monument is located at the distance of 15km from the pink city “Jaipur”. Jaigarh fort is always been a site of tourist attraction. The intricate carvings on the colossal walls stands atop all. The rain water harvest system found in this fort is truly amazing and speaks of the brilliance of Indian ancestors. This fort is also known as the fort of victory and is constructed for the military purpose, especially to store war weapons. This royal fort reflect the medieval construction style. The carvings and painting that adore this fort are the works of expert hands. This grandeur fort was erected during the period of Jai Singh ll between 15th to 18th centuries. The royal family used this palace as the hideout spot during war times. Even today we can see the hoary weapons and armours used then. There is museum inside this fort which displays puppets, artifacts, photographs and the war utilities of the Rajputs. The gigantic canon Jaivana is the major attraction of the fort. This fort is a must to visit place when you are visiting Jaipur. 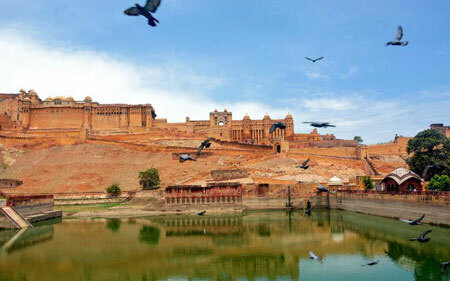 Apart from Jaigarh fort the pink city has surplus monuments, historic spots and palaces, which are worth visiting. Make a trip to Rajasthan and explore its marvellous beauty.